Doomy mirror-image to the triumphant first two hours of Steven Soderbergh‘s epic anti-biopic, Che: Part Two – Guerilla leaps forward 10 years – and, controversially, past Che’s brutal role in hundreds of executions – to find the doctor-turned-icon attempting a another revolutionary smash-and-grab. But Guerilla flips Part One: The Argentine on its bereted head. Setting up a Cuban-funded guerrilla camp deep in the hostile Bolivian jungle, Guevara leads another small group of battle-hardened revolutionaries into combat. This time, it’s disastrous. Locals reject them instead of joining them. An elite force of US-trained Bolivian Special Forces trap them like rats. Che and his men begin to die. In fact, seemingly unfolding in agonising real-time, Che: Part Two feel like one long death scene. Again shot on the shoulder – guerrilla-style, natch – but now without the gloss or flashback tricksiness of the Part One, Part Two swaps cinematic zeal for rough, harsh intensity. 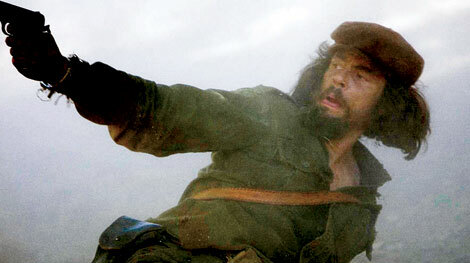 It rapidly becomes a kind of psychological nightmare movie as Soderbergh makes Che’s world start shrinking around him. Literally: Part One was shot in widescreen, Part Two tightens its frame to the more claustrophobic 1.85 aspect ratio. The thrilling jungle shoot-outs of The Argentine are replaced by sad silences and choked skirmishes for survival. A surprise cameo from one of Soderbergh’s Ocean’s Eleven comes an as unwelcome jolt, but otherwise the immersion is total. Distant, composed and wheezing from asthma, Benicio del Toro remains impenetrably charismatic and enigmatic. Flickers of Che’s character – warmth, cruelty, intelligence, intolerance – are there, but del Toro and Soderbergh refuse to define him or stumble into hyperbole. It’s an astonishingly bold move: this biography-by-osmosis lets us live with its subject for hours while never attempting to burrow under his psyche. Four hours and 22 minutes after Che began, do we really know anything about Ernesto ‘Che’ Guevara? As Guevara finally reaches the end of his revolutionary road, Soderbegh shoots him in close-up for the first time. And then – startlingly – in first-person. And suddenly, neither biography or politics somehow seem to matter at all in this strange, soulful oddity. Gripping, elusive and something to be experienced. Like the first of Soderbergh’s duelling war movies, /Che: Part Two/ continues to offer up surprises, fascinations and frustrations. Oh, what a lovely war! Che gets it right and so does Steven Soderbergh in the first half of his mega-movie. Death hangs heavy over Benicio del Toro this twisty crime thriller from Babel’s Alejandro Gonzalez Innaritu. Abel Grace provides another of cinema’s great looong movies about an inspirational war hero. More laughs in this one, mind.